India is building more than 14,000 bunkers suitable for families living along its border with Pakistan in Jammu and Kashmir, hoping to keep them safe near their homes instead of evacuating them as artillery shells scream over. On Tuesday evening, Pakistan used heavy calibre weapons to shell 12 to 15 places along the Indian side of the de facto border known as the Line of Control (LoC) that divides the disputed Kashmir region, a spokesman for the Indian defence forces said. The Indian army retaliated with its own shelling of the Pakistani side, he said. That had created “panic among people”, said Rahul Yadav, the deputy commissioner of the Poonch district, a remote area of the Indian state that faced some of the attacks. The new shelters, which were planned before this week’s spike in tensions, are supposed to reduce that fear and prevent people from having to flee when the shelling begins. There have been frequent exchanges of fire along the actual and de facto borders in recent months, but Tuesday’s firing marked a major escalation after India carried out an air strike on what it said was a training camp run by an Islamist militant group in Pakistan. India was responding to a suicide car bombing claimed by a member of the group that killed 40 Indian paramilitary police in Kashmir almost two weeks ago. As well as the shelling, Pakistan retaliated on Wednesday by carrying out airstrikes on the Indian side of the border and, according to officials in Islamabad, shot down two Indian jets over Pakistan. India accuses Pakistan of sponsoring militancy in Kashmir, Hindu-majority India’s only Muslim-dominated region. Villagers on the Indian side of the border said they were tired of fleeing their homes when outbreaks of firing erupt. Some have seen family members killed, and the cost of leaving behind their cattle and crops is too heavy for many poor farmers. Tanattar Singh, a frail 75-year-old man from Chachwal village, said his daughter was killed in 2002 when she was hit by a bullet just outside their house, which is surrounded by wheat fields near a watch tower. “Firing could happen again and we know there are risks of living so close to the border,” Singh said, as he and other elders watched earth being dug out for the construction of a bunker for one of the village’s 400 families. Government engineers said work on the underground steel and concrete structures, which could cost a total of $60 million, began in June last year as relations between the nuclear-armed rivals worsened. State government officials and contractors said hundreds of underground bunkers, with their walls and roofs three times the thickness of a regular house and consuming 10 times as much steel, have already been built. Reuters visited nearly a dozen such bunkers, some waterlogged and constructed on farm land or next to people’s houses. 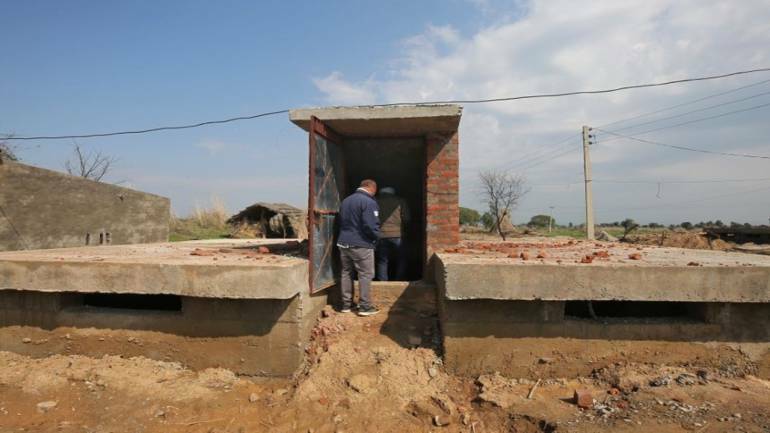 “These can withstand simple shelling,” said an engineer with the Jammu and Kashmir public works department tasked with building the bunkers. The engineer declined to be named citing government rules. On the Pakistani side of the border, most houses built after a ceasefire in 2003 do not have bunkers, though the Pakistani government does have a programme to build more. A number of people have been killed and injured by Indian shelling in recent days, and many have fled away from the border areas, said local officials. Muhammad Din, a resident of Chakothi, a border town, said most of the residents had moved to safer areas. “The only families still here are those who have concrete bunkers built within or along their homes,” he said. Thousands of people have either relocated or are planning to do so, said Umer Azam, senior administration official in Kotli, who has ordered the closure of schools in the most dangerous areas. Back in India, men rode motorbikes along the road between the sleepy Jammu villages of Suchetgarh and Gulabgarh, close to the border fence, despite a warning by security forces to exercise caution and stay indoors as much as possible. Shravan Kumar, whose wheat and mustard fields run along the barbed wire, urged Indian Prime Minister Narendra Modi to do more to end the frequent shelling, saying only a tough crackdown on militancy in Kashmir could “break Pakistan’s back”.